I thought I would give you all a sneak peak at the next book. So here is the first chapter or your reading enjoyment! Debra Cosgrove glanced in the rear view mirror as she drove I-44 through Missouri. She had barely managed to escape Kentucky by the skin of her teeth. Someone had been taking pot shots at her for two weeks, and despite all her knowledge and expertise, she had been unable to find the person responsible. She had spent nearly two decades as a hired assassin (she was not a serial killer, as the FBI claimed), and she knew how to make herself blend into a crowd in order to carry out a contract: wigs, glasses, padding to make herself appear heavier, Spanx to look thinner, different styles of clothing to appear as ordinary as possible wherever she went. Changing lanes to go around a semi, Debra glanced in the mirror again. A dark-colored truck that was a couple of cars back seemed to be tailing her. They were going a bit slower than she was, but staying close enough to keep her in sight. It was time to find out if they were really tailing her or just going in the same general direction. After getting around the semi, she moved back into the right lane, maintaining her speed at 72 mph. A couple of minutes later, the truck appeared in the left lane. She slowed down just a little bit, forcing the Nissan Sentra behind her to quickly get in the left lane to avoid hitting Debra from behind. The truck was forced to tap his brakes to keep from hitting the Sentra, and she sped up to 75 mph. The truck kept up with her, confirming her suspicions. A green highway sign told her she was close to one of the main Joplin exits. Waiting until the last second, she swerved onto the off-ramp. She checked the mirror and saw that the truck was stuck in the left lane and unable to get over in time to follow her. Thank God for technology. Using her iPhone, she got the address and directions for a car rental agency. Thirty minutes later, she was on the road again, this time in a dark blue Chrysler 300. After picking up the car, she had changed her appearance: long, black wig, brown contacts, glasses, white collared shirt with a black vest, blue jeans and black cowboy boots. As she crossed the state line into Oklahoma, Debra checked the rear view mirror for the truck, but she didn’t see it. Breathing a sigh of relief, she relaxed in her seat and settled in for the long drive to her next destination. She had a bad feeling it might be her final destination. Vinnie Amato pounded the steering wheel in frustration. He had wasted two hours trying to pick up Debra’s trail, but had crapped out. Peter Greco, his boss in New York, was not going to be happy about this turn of events. In the parking lot of a Taco Bell, Vinnie pulled out his phone and dialed his boss’ number. “Tell me you got her,” Greco said when he answered the phone. “How my genius sister ended up with a moron son like that, I’ll never understand,” Peter grumbled. “Do you think he is going to talk?” Vinnie said, watching a blonde woman walk out of Taco Bell and get into a 2013 candy apple red Corvette. “Then take care of it, Amato, or I’ll be sending someone to take care of you,” Peter said before he hung up. Vinnie got out of the car just as the blonde drove away. He’d get some food and gas before heading for the one place he thought that crazy Debra Cosgrove would go. 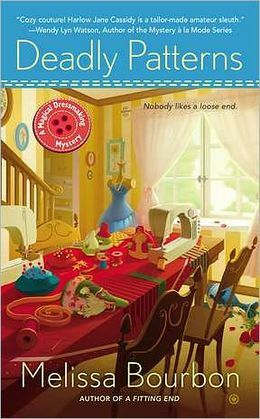 I fell in love with this wonderful series last year, and Deadly Patterns by Melissa Bourbon, the third book in the Magical Dressmaking mystery series, is even better than the first two! The town of Bliss, Texas is getting ready for the Winter Wonderland festival, with a fashion show being held in the old Denison house that was being remodeled for a grand reopening. But instead of taking care of some last minute details, Harlow Jane Cassidy falls on a body – literally. Who wanted Dan Lee Chrisson dead? Recently divorced, Dan Lee had left his wife and baby son for Maggie, who works for Harlow’s grandmother. Was it his ex-wife, Raylene, or her sister, Hattie, who was heard threatening the victim shortly before he was found dead? The list of suspects seems to grow the more questions Harlow asks. The sheriff and his deputy son believe it was Raylene, but the ghost of MeeMaw, Harlow’s great-grandmother, asks Harlow to believe that Raylene is innocent. As she nurses her cuts and bruises from her fall, Harlow tries to figure out who the murderer is, but all she finds are more secrets. As her relationship with Will Flores deepens, Harlow must decide whether to tell him her own family secret about Butch Cassidy, the infamous outlaw. Unraveling the threads of Dan Lee’s past leads to an old robbery by Bonnie and Clyde. Is this about that robbery, or is it about an old poker game that caused Charles Denison to lose the house to Justin Kincaid? Was Dan Lee killed by his sister-in-law, who wanted revenge for her sister? Harlow must use the Cassidy family charm to solve the mystery before the murderer gets away scot-free. Please forgive me, I’m not that good at writing a review. I loved the story. This is the third in the series, and with each book, the stories have gotten better. I love how Meemaw makes her presence know through the old pipes in the house, or by flipping pages in a magazine, or various other mischievous ways. Melissa Bourbon weaves a beautiful tale of a close knit family with an interesting family secret that very few people know about; they just think the Cassidy women are a little strange. There is a little bit of a history lesson in each book, whether it is about Butch Cassidy and his gang, or in this case, Bonnie and Clyde. I wish I was just as creative about describing the town of Brookdale from my Lizzie Crenshaw mysteries as she is with the town of Bliss. Deadly Patterns gets two thumbs up from me, or five out of five stars. It’s available at Amazon and Barnes & Noble. A week or so ago, I posted a question on my Facebook page, asking people what they would like to see me do on my blog. The feedback I got asked for book reviews and author interviews. So that is what we are going to shoot for! I have a nice stack of books waiting to be read, along with another stack that I’ve already read. I’m like all of you: I devour books. Books are like candy to me. On a cold day, I will grab a stack of books, some snacks, a blanket, and curl up in my favorite chair to read the day away. Keep in mind, I’m a mystery writer, which means that my favorite genre is…MYSTERIES! I know you can go anywhere to get a book review, but mine probably won’t be as formal. I’ll tell you what I think of the book, good or bad. If there is an author you want me to read, tell me here or shoot me an email! I’ll do what I can to read one of their books. I’m also going to introduce you to some new writers. 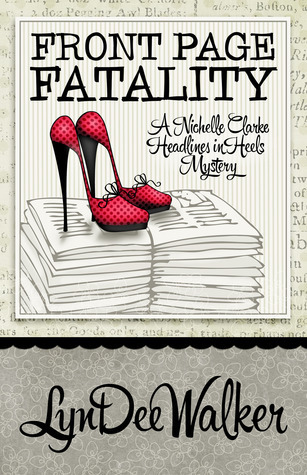 In fact, I have found a new book I can’t wait to read, Front Page Fatality, by LynDee Walker. It is her debut novel, and it looks very interesting! In fact, it is available on Amazon and Nook right now for $2.99! Why are you still sitting here reading this? Go, GO NOW!